Our 12th Step in Overeaters Anonymous tells us to “carry the message to compulsive overeaters….” The primary purpose of the Twelfth Step Within, therefore, is to carry that same message to those who still suffer within the OA fellowship. 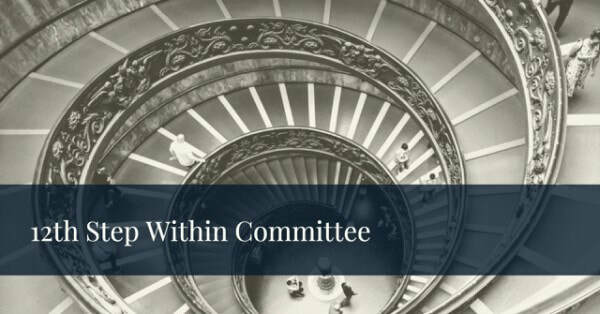 Thus, the Twelfth Step Within Committee deals largely with relapse and issues of membership retention – the message, of course, is hope. Accumulate ideas and information from RR’s who participate in this committee. Respond to requests from intergroups and fellow members for information related to this committee. All requests for meeting lists and sponsors-by-mail sent WSO. Development and maintenance of a list of available sponsors-by-mail for answering requests for same. Development of a method of supplying meeting list information as needed. Encouragement of formation of Twelfth Step Within Committees at the Intergroup level to deal directly with requests for such information. Follow the 12 Steps and 12 Traditions, follow the R2 Bylaws and expend funds as budgeted to accomplish committee functions. Communicate with the R2 Board through the Board Liaison.